This article contains the stats, strategy, and guide for Archer - David. We will update this as soon as the game comes out. David is the shepherd boy who slew the giant Goliath. David needed no sword or armor to slay the large soldier. Just five smooth stones and a slingshot. 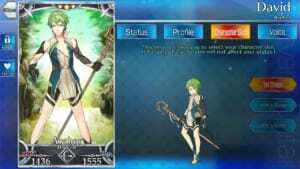 This article contains information about David of the Archer Class in Fate Grand Order [FGO]. We’ll update this when the picture comes out. David boasts excellent Stats, Skills, and Noble Phantasm. One of the notable Skills he has is Harp of Healing which not only spreads Heals across his allies but also grants 1 hit evasion. His card composition consists largely of Arts Cards which make him viable for Arts based Teams that focus on performing NPs. Invest on reinforcing his Harp of Healing to start spreading heals. To unlock it, be sure to ascend him. Given his access to a number of support skills, several offensive servants will appreciate his support. This includes Emiya who is known for having the same propensity to drawing Arts Cards, making chains easier to connect. Armed with Unlimited Blade Works, he can balance David’s support with his offense. Sharing the same class as Emiya and David is Billy the Kid, whose Eye of the Mind (False) grants him another cover against an enemy’s full Charge. To assist his mediocre C. Star absorption, attach a C. Star generation Craft Essence to make his innate Critical strength worthwhile. Another Archer class servant that shines alongside David is Arash, who will no longer rely on Starting NP Craft Essences because of the heals that David can cast. Apart from extending the Arts chains, his decent ATK can be mitigated upon unlocking David’s Charisma. Tamamo no Mae (Caster) pairs well naturally because of the card compatibility. Apart from that, she appreciates David’s heal and evasion buffs. To give David some offensive presence, Heaven’s Feel will boost his ATK and stacks with Charisma once it is unlocked. If players are looking to spam his NP to death, players can also grant David Formal Craft or Projection. However, there are two ways to go around this: one is to make David tanky and the other one to focus on offense. If going the defensive route, Iron Willed Training pairs well with David’s Divine Protection. Angel’s Song will boost the power of David’s Noble Phantasm similar to that of Heaven’s Feel. Independent Action A Increases own critical attack damage by 10%. Increases own defense by 50% for 1 turn. Grants party evasion for 1 hit. Own attacks will ignore evasion for 1 turn. Chance to seal the skill of an enemy for 1 turn. A young shepherd, back then, David didn’t know he was meant for greater things. He had several brothers who helped him tend to the sheep. But soon, David saw his brothers draft themselves in the war. A war between two nations and the other side had a large soldier. The large soldier’s name was Goliath. He struck fear into all those who dared face him. After all, who would want to face a man so large that he made squashing someone look so easy? Hearing the words of God, David decided to help his brothers. He first tried on the armor. Unfortunately, his small size made it unable to use the armor. Instead, he decided to confront Goliath with a shepherd’s staff, a slingshot, and some smooth stones. As he strode down the river, Goliath mocked the boy until David took a good shot with a stone to his forehead. As Goliath lay unconscious, he severed his head and won the war as the other soldiers chickened out. David soon became king of Israel where he had begun to build temples in God’s name. His countless victories made him well-known all throughout Israel with the Bible telling countless stories.